One of the best Filipino film that I have seen this year is "Barber's Tale" (Mga Kuwentong Barbero) . I had a chance to watch it twice in different screenings University of the Philippines Film Institute (UPFI). "Barber's Tale" is a carefully woven masterpiece, rooting from the past and gently unfolding issues that are still lingering in our country today. One of the charms of the film, is that it slowly captures the attention of its audience until the reality of the film is already clenching the heart of its viewers. The realistic portrayals of both actors and actresses were highly-commendable. I admire how the drama and seriousness of the scenes were spiced-up with occasional comedic situations (The comedy that is brought not just by people simply laughing together but a smart way of presenting a pun/irony of a situation). The nostalgic feel of the cinematography through its visual texture and color is intensified with an impeccable attention to details of the set designers. The unexpected grapevine of the characters amplified the tension of the whole film. "Barber's Tale" (Mga Kuwentong Barbero) can be compared to a time bomb that will give the audience the thrill in every second until the very end when it will burst on its unforeseen climax. Truly, "Barber's Tale" (Mga Kuwentong Barbero) is one of the best films made by the one and only Ms. Eugene Domingo. 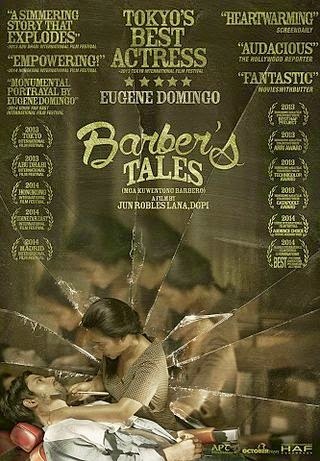 Barber's Tales (Filipino: Mga Kuwentong Barbero) is a 2013 Filipino drama film by Jun Robles Lana. The film stars Eugene Domingo as Marilou, a widow who is forced to take her late husband’s job as community barber during the end of Marcos era. The film is the follow up to Lana’s film Bwakaw and second of a trilogy focused on the small town life in the Philippines. The film had its world premiere and competed at the 2013 Tokyo International Film Festival, where it won the Best Actress Award for Eugene Domingo's performance. Barber's Tales is set in the rural town in the Philippines during the end of Marcos dictatorship, and tells the story of newly widowed Marilou (Eugene Domingo) who inherits the town's only barbershop from her husband- a business that has been passed down by generations of men in her husband's family. With no other means of support, she musters the courage to run the barbershop. But as to be expected, she fails to attract any customers. But a touching act of kindness she extended to Rosa, a prostitute who works in the town brothel, leads to an unexpected opportunity. Rosa, who now considers Marilou a friend, urges her prostitute friends to pressure their male clientele into patronizing Marilou's barbershop. The men have no choice but to grudgingly oblige out of fear that Rosa will expose their infidelity to their wives.